November 26, 2017--My sister sent me this picture of Frankie in its new frame. Love the texture of the frame and filet. She says it looks perfect in her living room. Me---so happy she likes it. September 11, 2016--Frankie is DONE! And I love it. And I wish I could keep it. This is a gift for my sister which will be given to her when visiting next month in her new Florida home. Can't wait to see how it will look on her walls. August 20, 2016--Working on Lesson 7 consisting of the background stitches. There are three parts to this lesson: Bokhara Couching Pattern for the narrow horizontal and vertical bands, Burden Stitch for the wide vertical bands and lastly the outer border area. The first of the three parts is done and here's a picture. August 12, 2016--Lesson 6 is completed. This lesson covered the Walnetos with Jessicas and Eight Point Stars. Love those stars--they are quick to stitch and the results are beautiful. The color difference in the stars is due to the fact that in one, the gold is stitched first, while in the other it is stitched last. 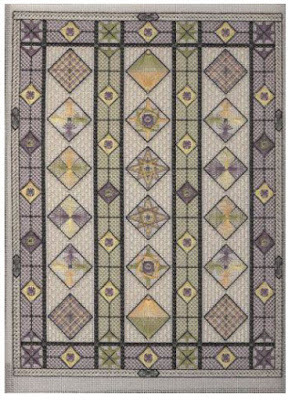 The last lesson covers the background or filling stitches, and the braided border. There's a lot to do here, but now this is a good TV watching project. August 9, 2016--Lesson 5 covering the Double Fans Doubled and Chilly Hollow stitches is done. Only four more "diamonds" to fill in, then all that's left are the background stitches. Rounding the bend to the finish. July 24, 2016--Back from traveling in New England and Canada and have finished Lesson 4. This lesson covered stitches for the Diagonal Padded Waffle and Mini Double Fans (these remind me of pinwheels). The colors are blending nicely. July 11, 2016--Lesson 3 is now complete. This lesson included the filling for the Diamond Jessicas (which I had already stitched before wrapping up Lesson 2), the Amadeus Stitch on the upper and lower bands and the Wheat Sheafs along the outer edges. Now on to the really fun stuff--those highly engineered Jean Hilton stitches. July 5, 2016--Happily stitching along and have finished Lessons 1 and 2, and half of Lesson 3 (out of a total of 7 lessons). June 29, 2016--Three years ago I signed up to stitch Frankie, a project by Michael Boren and Carole Lake of StitchPlay Designs (project photo below). It was being offered through Shining Needle Society and I was very excited to find it available as an online class. 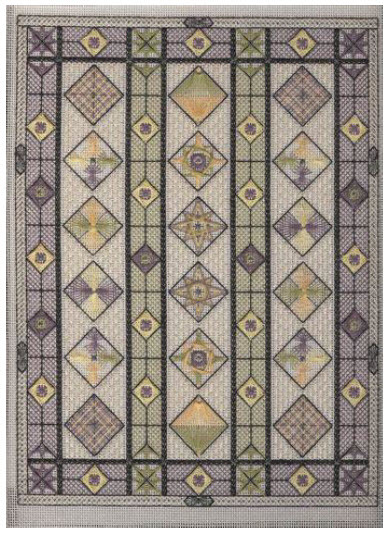 I had planned to stitch this as a gift for my sister whose home has a bit of Art Nouveau, Art Deco and Frank Lloyd Wright styling. When I visited her that year in 2013, she even helped me to choose threads to go with her decor. Move forward to 2016 and I've finally begun working on this piece. The instruction manual along with all the online class materials have a 1.5" width and are quite heavy. Just reading the pre-work portion of the instructions took some time to wade through. Well all that's behind me now and below is a picture of the pre-work completed. It looks a little wonky, so imagine vertical bars with stitching to cover all the traveling threads and bar tacks. There's a reason for starting this project now--I'm visiting my sister in October to see her new home in Florida (she moved from Dallas, TX) and would like to have this project finished by the end of the visit so I can leave it with her for framing. I plan on getting at least 75% of it done before I leave. It's a 19 hour train ride from Delaware to Florida, so should be able to get more stitching done while traveling. This is a beautiful project and am looking forward to putting color on the canvas. It's going to look lovely! Are you using the same colorway as what's pictured or going your own way? I'm using a brick color in place of the purple, so it should look very different. Hope the color change works. Beautiful so far. Looks like you'll be done by October. Nice gift! Did you put a small wooden frame, mat, and larger wooden frame around the piece? Stitching is great and the frame compliments it. I believe that's what my sister did. She called the piece between the mat and needlepoint a "filet". She and the framer did a good job selecting the colors.